Crazy Loop Straws With Funny Charms, (Pack of 6pcs) Reusable Drinking Straws. Made of BPA Free materials. 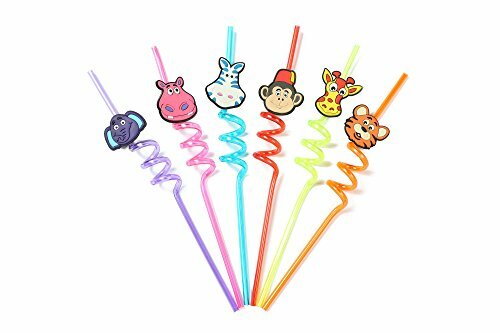 Also these novelty straws can help chidren to drink the certain liquids that they refuse. Great party accessories! These funny straws will liven up the parties, exited the people in the party! The spiral straws with decoration animal charms, cute and funny. Can be good gifts for your Children! Where to use -Friend parties.family dinners,beaches,all parties can be used. Material -Food grade hard plastic material.Safe,health and non-toxic,Both adults and children can use it safely. Washable and Reusable -Our straw can be reused after cleaning,Avoid waste of disposable straw and environmental pollution. Our services - If you have any question after purchasing,please contact us and we will solve it for you as soon as possible. If you have any questions about this product by Topicstraw, contact us by completing and submitting the form below. If you are looking for a specif part number, please include it with your message.